At Onion River Chiropractic, we use LaserStim™ cold laser therapy with patients who suffer with pain associated with a variety of conditions: Tendonitis (knee, ankle, forearm, shoulder, hip) bursitis, rotator cuff injuries, plantar fasciitis, carpal tunnel syndrome, tarsal tunnel syndrome, neck and back pain, muscle strains, soft tissue injuries, myofascial pain syndrome, peripheral neuropathy. It is helpful, safe and effective for those who have artificial knees or hip replacement or other metal implants. It is the only physiotherapy modality that can treat joint replacements as it does not cause vibratory insult or heating of the metal implant as is the case with ultrasound treatment. Laser works by emitting photons (light energy) into the mitochondria and cell membrane of the body’s tissues. It uses both red, visible light and infrared light which can penetrate the tissues from the surface of the skin up to a depth of 5 inches with a peak power of up to 25W. The diverse tissue and cell types in the body all have their own unique light absorption characteristics; that is, they will only absorb light at specific wavelengths and not at others. For example, skin layers, because of their high blood and water content, absorb red light very readily, while calcium and phosphorus absorb light of a different wavelength. Although both red and infrared wavelengths penetrate to different depths and affect tissues differently, their therapeutic effects are similar. 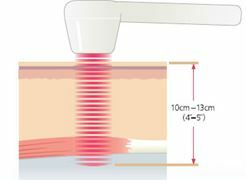 Visible red light, at a wavelength of 660nm, is beneficial in treating problems close to the surface such as acne, eczema, psoriasis, wounds, cuts, scars, trigger and acupuncture points, and is particularly effective in treating infections. Infrared light (905nm) penetrates deeper than visible light and is effective for treating ailments of bones, joints, and deep muscle tissue. Increase lymphatic system activity. Edema, which is the swelling or natural splinting process of the body, has two basic components. The first is a liquid part which can be evacuated by the blood system and the second is comprised of the proteins which have to be evacuated by the lymphatic system. Research has shown that the lymph vessel diameter and the flow of the lymph system can be increased with light. The venous diameter and the arterial diameters can also be increased. This means that both parts of edema (liquid and protein) can be evacuated at a much faster rate to relieve swelling. Increased phagocytosis, which is the process of scavenging for and ingesting dead or degenerated cells for the purpose of clean up. This is an important part of the infection fighting process. Destruction of the infection and clean up must occur before the healing process can take place. We are offering a Laser treatment special promotion which includes an initial examination and 6 laser treatment sessions for $150. This offer is not valid with any insurance, personal injury or workers compensation cases. Scheduled appointments are required. Valid until July 31, 2013. Call the office today at 802-655-0354 and see how effective Laser therapy can be for you! The old saying “the weight of the world on your shoulders” well picturizes what it is like for someone with a shoulder issue. The precise incidence of symptomatic rotator cuff injuries is not known. Cadaver studies of elderly persons have estimated full-thickness tears as high as 30%. An estimated 4% of cuff ruptures develop a cuff arthropathy. Various authors report a rate of success with conservative treatment ranging from 33-90%, with longer recovery time in older patients. [3, 4, 5] Rotator cuff injuries and tears usually do not occur in persons younger than 40 years (5-30%). The great majority is found in persons aged 55-85 years. Approximately 15% of patients with shoulder pain who are older than 70 years have rotator cuff injuries. Prevalence increases with age. Younger patients are more likely to have rotator cuff dysfunction because of overuse, subtle instability, and muscle imbalance. Older patients tend to have chronic shoulder pain and degeneration. One of the most common shoulder conditions is rotator cuff syndrome. The term “rotator cuff” actually refers to a group of muscles which stabilize and control primarily abduction, internal and external rotation of the shoulder. 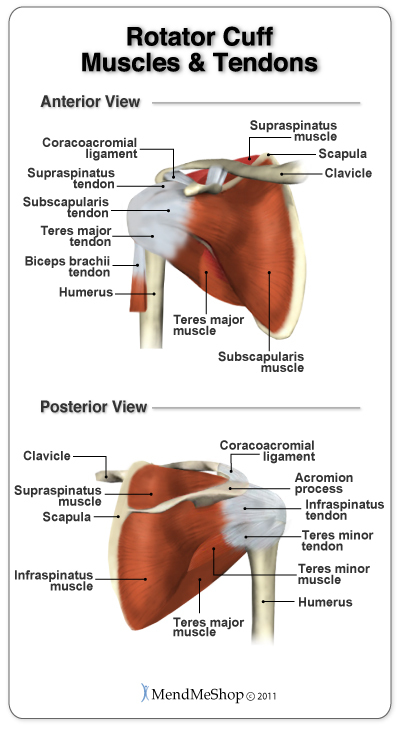 Often referred to as the “SITS” muscles: S= supraspinatus, I= infraspinatus, T= teres minor, S= subscapularis. They attach around the upper part of the humerus or arm bone and form a “cuff” around the ball and socket of the shoulder joint. These muscles are responsible for stability to the inherently unstable shoulder joint. Within the category of rotator cuff problems are: rotator cuff syndrome or rotator cuff myofascial syndrome, rotator cuff tendonitis, and rotator cuff tendon tears or frays. Of the three, rotator cuff tendon tears are the most severe. This is when one of the tendons of the rotator cuff muscles has become stretched, torn or severed, either due to chronic overuse, arthritic spurs at the acromioclavicular joint pushing down and fraying the supraspinatus tendon or a sporadic, traumatic event causing damage to the tendon. Unless the tendon has been completely severed, therapy or treatment such as cross friction massage, trigger point therapy, ultrasound, laser therapy or interferential current and specific shoulder strengthening exercises can usually significantly improve or heal the problem. If the tendon has been completely torn, the only option for reasonable recovery is surgical intervention. Rotator cuff tendonitis usually occurs due to repetitive and/or overuse of the shoulder and arm in certain positions which cause low grade strain to the muscle and specific tendons, and hence, an inflammatory process settles around the tendon in question and therefore a “tendonitis is born”. Tendonitis of the shoulders is often very reluctant to resolve and frequently eschew even consistent therapy, partly because of our constant use of our shoulder and arm throughout the day. Everyday tasks such as lifting a jug of milk, putting a plate up into the cupboard and sleeping at night on that side are all possible aggravators to an injured shoulder. The best treatments again include interferential stimulation, ultrasound, laser therapy (to decrease the inflammation and promote cell regeneration), specific Active Release therapy to tightened rotator cuff muscles and cross fiber massage across the rotator cuff tendons, as well as rehabilitation exercises to strengthen the rotator cuff and surrounding parascapular/shoulder blade supportive muscles. Rotator cuff myofascial pain syndrome is, quite simply, a condition in which there is chronic inflammation and myofascial trigger points throughout the rotator cuff muscle especially in the belly of the muscles. Probably one of the most common problems of the shoulder, this condition causes a progressive tightening of the rotator cuff muscles. Symptoms include achy, burning pain in the local area of the shoulder and sometimes with referral into a specific trigger point pattern i.e. down the arm, into the shoulder blade, or into the front of the shoulder. This condition will be negative for abnormality on x-ray and MRI and will not necessarily respond very positively initially to strengthening exercises. Although orthopedists generally very easily diagnose shoulder pathology as osteoarthritis, rotator cuff tendon tears, etc., this condition often eludes even the very knowledgeable shoulder specialists (especially if they are not familiar with Dr. Janet Travell’s extensive research and documentation of myofascial trigger point conditions). This condition is very successfully treated with specific myofascial release, trigger point therapy or Active Release techniques to rid the area of fibrous feeling “knots” (or trigger points) in the specific muscles. A tell-tale signal of a rotator cuff myofascial pain syndrome is when one pushes on a big knot in a rotator cuff muscle and pain refers to another area of the body, (typical trigger point patterns of referral). In order to successfully treat this condition a highly skilled therapist (chiropractor or massage therapist who is specifically experienced with trigger point syndromes) will be best able to resolve this condition. Swedish type massage generally will not resolve this type of condition. With all of these conditions, after successfully reducing the muscular tightness and offending trigger points and reducing the inflammation in the tendons and/or muscles, shoulder stretching, rotator cuff strengthening, as well as parascapular stabilization exercises are important in full recovery. Postural retraining and ergonomic evaluation of home and work station are often vital to prevent return of the condition. Moosmayer S, Smith HJ, Tariq R, Larmo A. Prevalence and characteristics of asymptomatic tears of the rotator cuff: an ultrasonographic and clinical study. J Bone Joint Surg Br. Feb 2009;91(2):196-200. [Medline]. Ecklund KJ, Lee TQ, Tibone J, Gupta R. Rotator cuff tear arthropathy. J Am Acad Orthop Surg. Jun 2007;15(6):340-9. [Medline]. Fongemie AE, Buss DD, Rolnick SJ. Management of shoulder impingement syndrome and rotator cuff tears. Am Fam Physician. Feb 15 1998;57(4):667-74, 680-2. [Medline]. Hayes K, Ginn KA, Walton JR, Szomor ZL, Murrell GA. A randomised clinical trial evaluating the efficacy of physiotherapy after rotator cuff repair. Aust J Physiother. 2004;50(2):77-83. [Medline]. Greiwe RM, Ahmad CS. Management of the throwing shoulder: cuff, labrum and internal impingement. Orthop Clin North Am. 2010 Jul;41(3):309-23. Matsen III FA, Fehringer EV, Lippitt SB, Wirth MA, Rockwood Jr. CA. Rotator cuff. In: Rockwood CA Jr, Matsen FA III, Wirth MA, Lippitt SB, eds. The Shoulder. 4th ed. Philadelphia, Pa: Saunders Elsevier; 2009:chap 17. Seida JC, LeBlanc C, Schouten JR, Mousavi SS, Hartling L, Vandermeer B, Tjosvold L, Sheps DM. Systematic review: nonoperative and operative treatments for rotator cuff tears. Ann Intern Med. 2010 Aug 17;153(4):246-55.